ANN ARBOR, Mich. — There’s a hockey dynasty in southeast Michigan, but few people know it exists. Far from the bright lights of Joe Louis Arena in Detroit, where the Red Wings hunt for their first Stanley Cup title since 2008, a group of high-school students in Ann Arbor are picking up world championships on a regular basis. They are the 44 members of USA Hockey’s National Team Development Program, based at the Ice Cube on the outskirts of town, and they’ve just returned from a successful trip to Sweden. Split into the U.S. national U-17 and U-18 teams, they won both Five Nations age-group championships, each posting 4-0 records against fields made up of national teams from Finland, Sweden, Russia and the Czech Republic. In April, players from the NTDP will head back overseas to take part in the World U-18 championships in Finland. A victory, something that seemed an impossible dream when the program was started in 1996, would be America’s eighth since 2003 and its fifth in six years. NTDP players were also at the core of the team that won America’s first World Juniors title, in 2004, and followed it up with championships in 2010 and 2013. The U.S. is a powerhouse now, and you can see the envy in the programs from other countries. 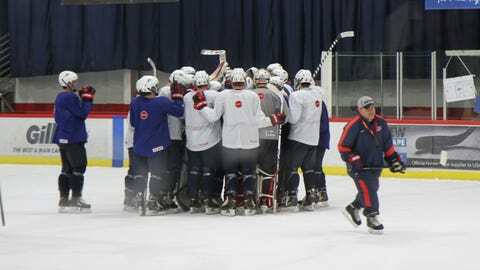 "The U.S. is a powerhouse now, and you can see the envy in the programs from other countries," U-17 coach Don Granato said. "There’s a fear factor for them — it is scary to see the accelerated pace that hockey has developed in the United States." Although the kids spend only two seasons in Ann Arbor, their impact on American hockey spreads far beyond youth tournaments. Seven NTDP graduates were on the U.S. team that won a silver medal in the 2010 Winter Olympics, and there are nine currently playing in Sochi: goalie Jimmy Howard (Red Wings); defensemen Justin Faulk (Hurricanes), Cam Fowler (Ducks), Kevin Shattenkirk (Blues) and Ryan Suter (Wild); and forwards Patrick Kane (Blackhawks), Ryan Kesler (Canucks), Phil Kessel (Maple Leafs) and James van Riemsdyk (Maple Leafs). Those currently in the program aren’t getting to watch much of the Olympics. They’re sleeping while the Games are taking place, getting ready for their dual lives as hockey players and full-time students at Ann Arbor Pioneer High School. But they’re keeping track of what’s happening. "Once you play with ‘USA’ on your chest, it means even more to watch the Olympic team," U-18 forward Dylan Larkin said. "That team is where every American hockey player wants to be." The program has succeeded at so many levels — almost every player goes on to a college career and more than 130 have ended up in the NHL — that it’s hard to believe how hard Jeff Jackson had to fight to create it. In 1996, Jackson, who made a name in hockey with two NCAA titles at Lake Superior State, was interviewing for a position as USA Hockey’s national coach. When he returned for his second interview, he came with a plan that would change men’s hockey in the United States. "They wanted to develop a system for the development of young players for national teams, and I thought the only way to do it was to have a full-time program that would go throughout the hockey season," Jackson said this week. That wasn’t what USA Hockey’s brain trust in Colorado Springs had been thinking about. They were looking for a summer program that would leave kids at home during the school year, but Jackson didn’t believe that would work. "If we were going to do it right, we would have to have them for the whole school year," he said. "Quite frankly, a lot of the people in Colorado Springs were not in favor of the program, which made it very challenging." Jackson dealt with just as much as opposition outside the national hierarchy because teams from across the country faced losing their best players to a program based in a rink located in an undeveloped part of a college town in a flyover state. Jackson, a native Detroiter, put the program in Ann Arbor rather than near USA Hockey headquarters in Colorado Springs or one of the country’s other hotspots. "Everything about the program was controversial," Jackson said. "It was controversial as far as expense. We had to pay the staff, we had to house 48 kids, we had to work with the school system, and pay for the travel and the equipment and everything. "It was also controversial because we were pulling kids out of Minnesota high schools and prep schools out East, and pulling them out of midget programs and junior programs. Everyone in the country was up in arms." A coach without Jackson’s resume might not have been able to pull it off. "With Coach Jackson, we had someone who had been a winner and was a great teacher," said Scott Monaghan, the senior director of NTDP operations. "He was the brains behind this whole concept. Jeff laid the foundation, and he rode out all of the controversy. "Mike Eaves came in after Jeff, and he won the first world championship, in 2002, with the Ryan Kesler and Jimmy Howard group, but he did that with full appreciation of everything that Jeff had done before him." Jackson’s ultimate plan was to build the program into a developmental league for the top youth players in the country, but he was never able to conquer the opposition of the leagues that would have lost even more players to USA Hockey. That led him back to the college ranks — he’s now the coach at Notre Dame — and is the one regret he has about his creation. "The goal was to develop players for our national team, and since the program started getting the best players, we’ve had a lot more success at the World Juniors, the U-18 World Championships and the U-17 World Challenge," he said. "Obviously now, a high number of the Olympic team has come from the NTDP. My only disappointment is that we didn’t reach more kids." Jackson’s brainchild has matured into a program led by Granato, a long-time minor-league coach and NHL scout, and U-18 coach Danton Cole, who played at Michigan State before 318 games in the NHL and a coaching career that included three seasons with the Grand Rapids Griffins. Both Granato and Cole won NCAA titles as players, Cole in 1986 and Granato four years later at Wisconsin. "The nice thing about coaching here is that everyone wants to be here," Cole said. "They can’t play in the NHL yet, so this is as good a place to be as there is for them. "In college and the AHL, everyone wants to be in the NHL, and in the NHL, half the guys want to be on another team. But the kids here are all the same age and they are together for two years, and that creates a unique situation." The 22 players in each age group have survived a process that starts with the scouting of 14-year-olds around the country. "When we started, we were recruiting players, but now we’re getting calls from parents asking what their 11 or 12-year-olds need to do to get into our program," Monaghan said. "We start watching them when they are 14, but we don’t start talking to them until they are 15. "After that, we start asking our top prospects if they are interested in us and then we narrow it down to the kids who come to our tryout camp. We pick 22 from there, and that’s our team for the next two years." Those kids are in for what Cole calls a "grind." They attend Pioneer during the morning and early afternoon — the only academic break they get is not having to take gym — then spend several hours practicing, working out and taking life classes at the Ice Cube. They get home to their host families in time for dinner and a couple hours of homework and relaxation before a 9 p.m. curfew. It doesn’t get any easier on game day. The U-17s play most of their schedule against United States Hockey League teams, competing against players who are a year or two older, while the U-18s add games against some of the top college teams in the country. "We’re very careful about the players that we take because this is a brutal program," Cole said. "If we look at a kid who has a 2.8 grade-point average, we’re not going to want him, because if he’s not willing to work hard in the classroom, he’ll end up being lazy on the ice. "We want kids who are fully committed to this whole program." The schedule is a rough transition for teenagers used to dominating every game they play in, but it makes things a lot easier when they face international teams in their own age group. "Most of the time, our goal is to put our kids into uncomfortable situations on the ice, where we are looking to compete without always worrying about winning," Monaghan said. "We have kids who are used to scoring two goals a game who might get to Christmas and only have two goals total. "When they get into international play, that’s when the focus turns to winning championships." Even so, there are special moments on home soil. In December, the U-18s took one of the shortest road trips of their lives, driving three miles across town to Yost Ice Arena for a game against third-ranked Michigan. Team USA trailed 4-2 with a minute left in regulation, but scored twice in the final 52 seconds before Alex Tuch won the game in overtime. "That was so much fun because we’re right here in Ann Arbor, where everything is about Michigan," said Larkin, who set up the game-tying goal. "That’s probably my greatest moment in a Team USA jersey." Larkin, who will be attending Michigan in the fall and is projected to be a first-round pick in next summer’s NHL draft, hopes to get a chance for bigger achievements in the red-white-and-blue. He’s expected to be on the World U-18 roster in April and has a shot at the World Juniors over New Year’s. After that, the dreams will turn to an NHL career and, eventually, a spot on an Olympic roster or a World Cup team. Until then, he’s got homework to do.